Just before Christmas, and two days before the terrorist attack on the Bataclan theatre, I had booked a two night trip to Paris in order to see the acclaimed “Splendours and Miseries” exhibition at the Musée d’Orsay, and the newly refurbished Musée Rodin. The exhibition at the Musée d’Orsay certainly lived up to the hype and it was while strolling from there, along the left bank of the Seine back to our hotel, that we decided to take a detour to Saint-Sulpice hoping to hear the wonderful organ. When we got to the church we were a little taken aback by the presence of armed police and security guards but assumed it was part of the heightened security measures in place in Paris at the moment and decided to go in anyway. 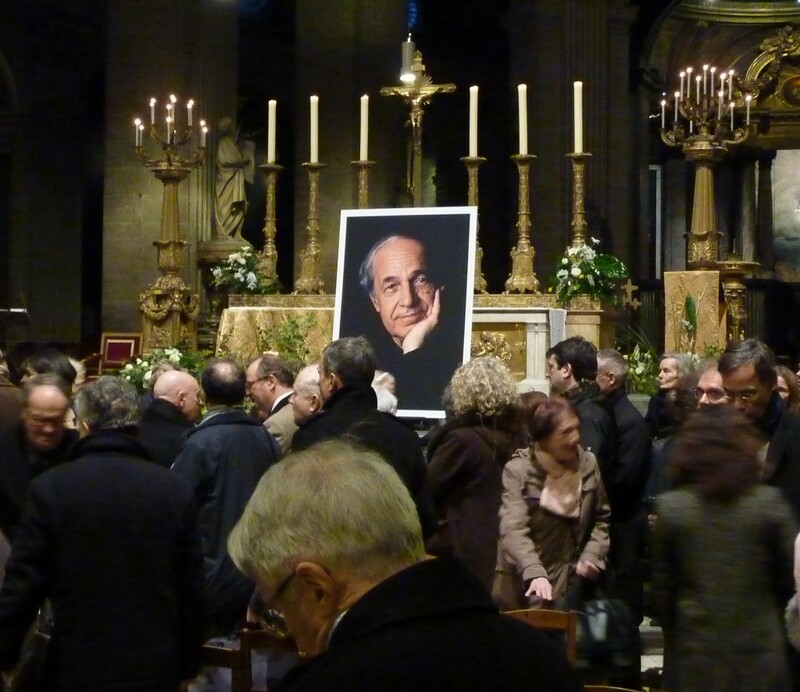 By pure chance we had arrived 10 minutes before the start of the memorial service in thanksgiving for the life of Pierre Boulez, who had died on January 5th aged 90. Having been a little apprehensive about visiting Paris after recent events, and determined to avoid anywhere that could be regarded as a terrorist “target”, we now unexpectedly found ourselves in the company of the French Prime Minister Manuel Valls, conductor and pianist Daniel Barenboim, and many other luminaries from across the French political and artistic spectrum! Boulez’ funeral had been held the previous day in Baden-Baden, south-western Germany, and this service was the occasion for France to pay its respects. It was essentially a private event but the church was still open to the public. Seats for the family, dignitaries and friends had been reserved at the front but there were plenty of seats available, although they quickly filled up. We picked up an order of service and, looking through it, could not believe that we had unwittingly found ourselves about to witness a small moment of music history in the making. At 4pm the service quietly began with extracts from Boulez’ Dialogue de l’ombre double, pour clarinette with soloists from l’Ensemble Intercontemporain spaced around the front of the church, and this was immediately followed by Daniel Roth, organist at Saint-Sulpice, playing Messiaen’s Apparition de l’Église Éternelle. From the simple strain of a single clarinet, emanating as if from nowhere, the church was gradually filled with sound as the organ grew ever louder before subsiding again in preparation for the welcome by père Jean-Loup Lacroix. From here on music and words alternated. We heard Boulez’ Anthèmes 1 pour violon; a eulogy from Daniel Barenboim; a reading from the book of Job and a sermon; two of Bach’s most intricate and complicated canons from his variations on Vom Himmel Hoch for organ. Another eulogy followed, this time from Renzo Piano (the architect who, amongst other things, designed the Pompidou Centre in Paris and The Shard in London); a transcription for voices of Farben op.16 no 3 by Arnold Schönberg sung by Accentus (conducted by Laurence Equilby); a psalm (De Profundis) and prayers. The final eulogy was given by Laurent Bayle (president of the Philharmonie de Paris) after which members of l’Ensemble Intercontemporain played Boulez’ Mémoriale, pour flute et huit instruments. The final blessing was given and Daniel Roth played Bach’s fitting Prelude and Fugue in b minor BWV 544 while the congregation dispersed. The atmosphere of the occasion was sombre. This was not a celebration but rather a respectful tribute, a threnody almost, on the passing of a composer whose name is writ large in the history of western music. Laurent Bayle beautifully captured the spirit of the moment when, at the end of his eulogy, he paraphrased a text Boulez himself had read at the funeral of Edgard Varèse: “Adieu, Pierre, adieu! Ton temps est fini et il commence”.